As you all know, Google is pretty hard-up about duplicate content, now more than ever, because an awful lot of blogs and websites have started making money by blatantly copying material from other sources. This not only is unfair to the original source, it also jeopardizes the integrity of search results returned by Google. Hence the stringent TOS (Terms of Service). But what about adding quotations, or sentences/paragraphs quoted from other websites? It does classify as content copied directly from another website. So how does Google treat such content and is it safe to include it on your website? Well, Google just released a video explaining how Google treats such content. The issue was addressed by a video from Matt Cutts, head of Google's webspam team. In that video, he talks about the different practices applied by bloggers and webmasters online, and which of them is good and which isn't. You can see the video embedded below. In an ideal world, people would only copy quotations, or things said by others that they like. For example, quoting a sentence from an author or public figure, quoting someone from their live speech somewhere (chances are, that speech will be copied by someone else too), an announcement, quoting from another blogger whom you find insightful etc. That is how quotes are supposed to work. If that's the case, and you want to add such content on your site, then you can do it without fear, so long as you link to the original source. Credit should be given where credit is due. 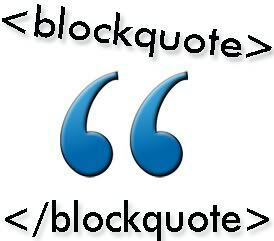 Just make sure you put the quotation in a block-quote tag, and everything will be fine. People often ask, How will Google know whether it's just a quotation, or copied content that could get them penalized? Well, Google has some smart algorithms that will detect whether it's a quote or copied content. Besides, Google might check out your site manually. So don't worry if you've kept your end of the deal, and added a link to the original source and put the content in a block-quote. Like much else, people are bound to exploit loopholes. Which is why Google is working on leaving as few as possible. It allows you to quote another site. But if you think you're gonna get away with copying an entire article as a 'quote', and then adding a link to the source, then think again. This practice will get you penalized.